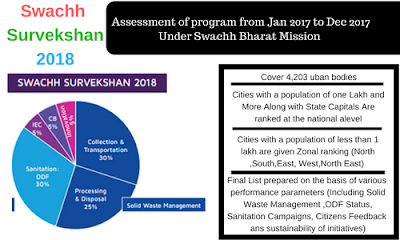 Swachh Survekshan 2018, which was the first pan Indian exercise to assess cleanliness in urban India, surveyed 4,203 cities from January 4 to March 10, 2018. How the survey is conducted? Under this survey, cities will be ranked based on 71 sanitation related parameters with different weightages for a total of 4,000 marks. Total score has been doubled this time to avoid crowding of cities with very marginal differences in scores that happened in the previous survey. Greater Mumbai was found to be the cleanest among all state capitals. Mysuru has emerged as the cleanest among cities with population of three lakh to one million. 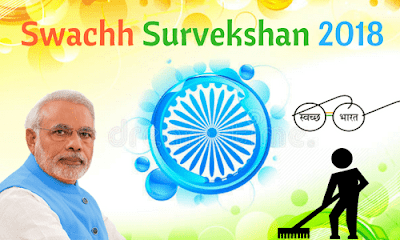 Which of the following ministry organized Swachh Survekshan 2018? As per Swachh Survekshan-2018 which state has been declared the best-performing state? Solution: Jharkhand has been declared the best-performing state, followed by Maharashtra, in this year's Swachh Survekshan. Which of the following is not correct with respect to Swachh Survekshan-2018? c. The survey assessed sanitation in all 4,041 cities and towns of the country. Which of the following city emerged as cleanest among big cities having more than one million population? Solution: Vijayawada is cleanest among big cities having more than one million population while Mysuru has emerged as the cleanest among cities with pollution of three lakh to one million.